As hard as it may be for some people to believe, corn is grown in some parts of Arizona. Schnepf Farms in Queen Creek has been growing a corn maze for a number of years. This year’s maze features Muhammad Ali. 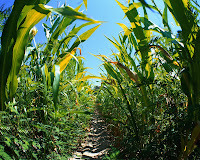 Below is a link to a slide show of this year’s corn maze plus some from past years courtesy of azcentral.com. There are lots of things to do at Schnepf Farms, so check out their website to see all of the options.